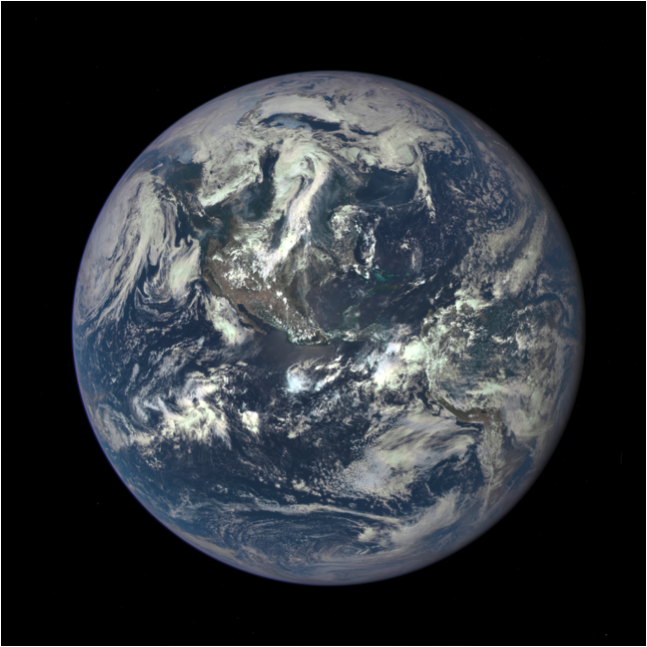 Earth as seen on July 6, from a distance of almost one million miles by a NASA scientific camera on board the Deep Space Climate Observatory spacecraft. Credit: NASA. What do outer space capsules, submarines, and office buildings have in common? Each was conceived as a closed system: a self-sustaining physical environment demarcated from its surroundings by a boundary that does not allow for the transfer of matter or energy. The history of twentieth century architecture, design, and engineering has been strongly linked to the conceptualization and production of closed systems. As partial interpretations of the world in time and in space, closed systems identify and secure materials necessary for life. Contemporary discussions about global warming, recycling, and sustainability have emerged as direct conceptual constructs related to the study and analysis of closed systems. In February 2016, Storefront for Art and Architecture will open Closed Worlds, an exhibition of 41 living prototypes built over the last century that present an unexplored genealogy of closed resource regeneration systems. From the space program to countercultural architectural groups experimenting with autonomous living, the exhibition documents a larger disciplinary transformation in the postwar period and the rise of a new environmental consensus in the form of a synthetic naturalism, where the laws of nature and metabolism are displaced from the domain of wilderness to the domain of cities and buildings. For this exhibition, Storefront for Art and Architecture is looking for a designer to produce the 42nd piece of the chronology of experiments. The selected designer(s) will have the opportunity to use the installation as a testing ground for a new closed system. The designer will work closely with the Closed Worlds curatorial team. Once the proposal of a Closed System is selected, the designer will be responsible for the development of the installation and for the display of related exhibition materials into the space of the gallery, leading the overall exhibition design. You can find exhibition research information and documentation samples in the right column, in “Documents”. This call is open to anyone with demonstrated experience in the conceptualization, design, and production of spatial prototypes, including architects, artists, designers, engineers, and environmental scientists, among others. The winning team will be based in New York or be able to easily produce and manage the final design and construction of the installation and hold regular meetings with the Closed Worlds curatorial team. The winning team will be able to work intensely within a given time frame for the preparation and installation of the exhibition between November 2015 and February 2016. Applications will be accepted from individuals and firms, and architects need not be licensed. Interdisciplinary collaborations are strongly encouraged. Applicants outside of New York City are eligible to apply, but housing and transportation will not be provided. The jury will value the originality and poignancy of the elements to be considered essential in the definition of a closed system. From human waste (excrement, sweat, skin particles) to digital/electronic waste (data, hardware) to forms of capital (energy generation, organic remediation, light), the proposal should clearly identify the essential sources that drive the closed system. Although the closed system (digestive machine) should perform certain conversions, feedback efficiency will not be the primary criteria of the jury, as disobedient machines – critical devices – will also be valued. The content of the Closed Worlds exhibition is extensive and includes an archive of 41 projects (including images, texts, logos, drawings, bibliography, and other data for each project), 41 respective speculative feedback drawings, a large-scale graphic timeline, and an extensive lexicon of keywords in environmental history. Applicants are encouraged to experiment with and suggest different formats of display, but final layout will be determined in collaboration with the exhibition’s curatorial team. The winning designer(s) will be awarded a production budget of $12,000 for construction, assembly, and disassembly of the closed system. Additionally, the selected team will be awarded a design/managing fee in the amount of $1,500. All other production and fabrication expenses related to the closed system exceeding $12,000 shall be assumed by the winner. An independent budget will be allocated for the printing of the archival materials and exhibition signage. The winner will work with the Storefront for Art and Architecture production team to realize the design, and will work with the Closed Worlds curatorial team to fulfill all exhibition requirements. The winning team will be responsible for project management of any manufacturers/vendors involved in production. The completed project is scheduled to open to the public in February 2016. The project will be widely publicized through Storefront’s media channels and social networks. All questions should be emailed to closedworlds@storefrontnews.org by November 3rd, 2015. Relevant questions and answers will be posted on Storefront’s website (www.storefrontnews.org) on the Closed Worlds exhibition page before or on November 6th, 2015. Storefront’s gallery is open to the public from Tuesday through Saturday, 11:00 AM to 6:00 PM. On October 29th from 5 to 6 pm, Max Lauter, Storefront’s Gallery Manager and Project Coordinator, will conduct a walk-through of the gallery space for interested applicants and will answer any questions in person. To download Storefront for Art and Architecture’s gallery plan, click here. To see photos of past installations at Storefront for Art and Architecture, see our online archive or photo gallery. Competitors are required to register for the competition in advance of the submission date. Registrations must be received by November 10th, 2015 before midnight. There is a $50 registration fee ($25 for members of Storefront). Projects that have not registered by the November 10th deadline will not be reviewed. After registration, each applicant will receive an email with registration confirmation. A digital PDF (15 MB or less), uploaded to the competition platform no later than 11:59 p.m. on November 16, 2015. A bound proposal documentation book, delivered no later than November 17 at 6 pm to Storefront’s office at 611 Broadway, Suite 634, New York, NY 10012. Proposals received after this date and time will not be accepted. (Note that Storefront’s office is located at a different address from its gallery space). Page 1: Contact Information. Please fill out and include the competition cover sheet as the first page of your submission. Page 2: Project title and mission statement of no more than 300 words, summarizing the proposal (1 page). Page 3: Feedback drawing or diagram that represents the proposed closed system. Representationally, the identification of closed systems is linked to arrows and movement, with clear understandings of their context in both spatial and temporal frameworks (1 page). Page 4-9: A series of images (up to six) including a plan, elevation, and section that collectively provide an understanding of the material, spatial, and programmatic qualities of the proposal (6 pages). Page 10: Material specifications, production processes, and production times for the materialization of the project (1 page). Page 11: Preliminary budget (1 page). Page 12: Dispersal material plan or afterlife plan (1 page). Up to ten (10) digital images of recent work. (These images are in addition to images submitted as part of the project proposal). For each image, include the title, date and a brief description of the work. The Jury reserves the right to cancel the competition and/or reject any and all proposals received in response to the call for ideas. Closed Worlds is curated by Lydia Kallipoliti and is supported by the Graham Foundation and the New York State Council for the Arts. Digital submissions must be entered through the submission website by November 16, 2015 at midnight. Physical submissions must be delivered to the Storefront for Art and Architecture office on or before November 17, 2015 between 11 am and 6 pm EST. Mailed submissions must arrive at the office by the submission deadline (note that the deadline is the date of receipt, not a postmark date). Please note the office address below (and note that this is a different address from Storefront’s gallery space). The winning entry will be notified in late November 2015. Copyrights for project submissions shall remain the property of the author. The structure created for the Closed Worlds exhibition will become the property of Storefront for Art and Architecture and the Closed Worlds curatorial team. Submitted materials shall not be released nor exposed to the public, press, or other media before the announcement of a winning entry or the cancellation of the Competition. Applicants who violate this will be disqualified. Participants agree to permit Storefront to use the submitted materials in public posts, publications, or exhibitions, or for archival, promotional, educational, and other purposes at its discretion. The Jury and/or Storefront for Art and Architecture reserve the right to cancel or suspend the Competition for any reason, including those causes beyond the organizer’s control that could corrupt the administration, security, or proper participation in the Competition. Storefront for Art and Architecture assumes no responsibility for postal, email, electronic, technical, or natural conditions that prevent the receipt or judging of a Competition submission or any part thereof. Storefront for Art and Architecture reserves the right to amend these Guidelines at any time without notice. No information contained in submissions shall be deemed confidential and such information may be shared with other governmental entities. Therefore, please do not submit any information that may be deemed proprietary in nature. Competition sponsors shall not be liable for any costs incurred by any respondent in the preparation, submittal, presentation, or revision of its submission. Competition sponsors shall not be obligated to pay and shall not pay any costs in connection with the preparation of such submissions.